Okay, maybe not stress free, but a LOT less stressful than my four year old's party that was just two weeks after this one! When Ethan turned two just a few weeks ago. I knew I wanted to keep it low key. He's only little after all, and isn't keen on lots of people or a lot of structure. Plus he also had another family party the same evening. Here's how we did his friends' "party". 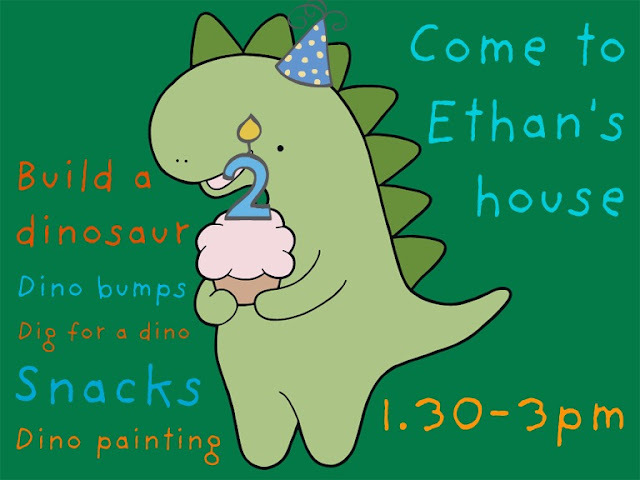 These were the invites we sent out to Ethan's three best friends. Just a quick mess about in Picnik (or you could just as easily do it in PicMonkey now) to make them. Bear in mind time, I picked a time when all the kids would have been fed, so I didn't have to worry about providing a lot of food. Plus I knew Ethan would have had his nap. Pick a few activities, but don't worry if you don't get them all done. We went with the flow. I had some activities ready to go (more on that in a bit) and some ideas that didn't happen because of the weather. Plus we let the boys and Izzy do what they wanted; play upstairs, read, etc. Pick one snack and just worry about that. I decided cupcakes would be a nice one, plus we also turned it into an activity. So here's how we did it. When the boys arrived there were all Ethan's dinosaurs in the living room with blocks to add scenery. When the boys arrived we opened presents from them and played, just letting them settle in with their parents and get used to our house. Then the boys played upstairs (Ethan persuaded them!) while I got the painting activity ready. All the kids were informed it was messy play, but I did offer painting aprons. No takers though! Then the boys and mums got cleaned up and played with the dinosaurs in the living room. And I got out the Dino tail party favours! The boys and mums went home happy, and I had very little clean up to do! Sweet! So what about you? Any tips on how to have a stress free kids party (if that's possible!). The dino tails are too cute! We have a pretty steady group of 5 families that all have kids the same age (older ones 4.5, younger ones 2-3ish), so every birthday party is just us. Same 5 families, usually a bounce house (we own one), juice boxes for kids, champagne for grown ups, playing. It's been 4 years of this and all the kids are pretty used to home parties. Every time one of mine asks for something else, I just say "no". Thank you! Though I could never design something so cute, Jessica did a great job with the tute. Ha ha, shame I don't drink then! I guess I'll have to make do with left over cupcakes for after the party's over and I'm faced with the clean up! Yes, the tails are super adorable!! I don't know how to have a stress-free kids party besides what you did, to be honest. Have an activity or something planned, but don't worry too much about MAKING it happen. A snack or two, parents around if they kids are super young, etc.